r co-founder Evan Williams said in a recent blog post. Retweeting goes to the heart of what Twitter is all about, because it exposes users to interesting topics, blog posts, or news items they may not have otherwise seen. For the uninitiated, a retweet is a way to rebroadcast another twitter user's message. Originally, you had to copy the username and message into Twitter's text entry box and type the letters RT in front of the message. If the retweet took up less than Twitter's 140-character limit, you could also add your own comments. Now, with the new retweet feature, you can rebroadcast messages in just two clicks. Retweeting is currently available only on Twitter.com, but third-party developers do have access to the new feature so it should be coming to your favorite Twitter client in the near future. 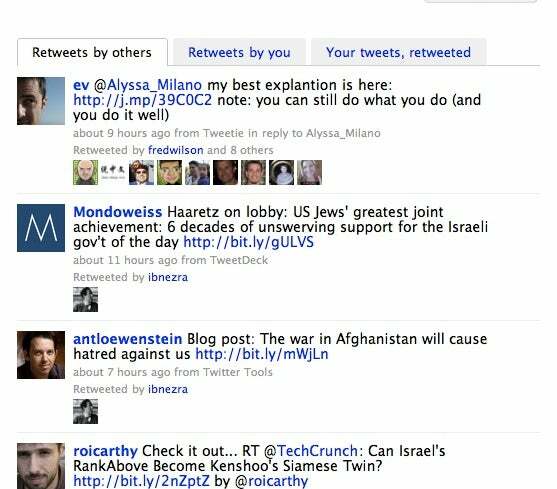 Like many other features on Twitter, the custom of retweeting started with Twitter's community of users before the company formally adopted the practice. But unlike other grassroots Twitter features such as hashtags and @replies, there are things to love about Twitter's official retweeting function, and things to complain about. Granular Controls: You may love to see tweets from your sister, but what if she sends out way too many retweets? Twitter has got you covered by allowing you to turn off all retweets from your sister. You'll still receive her original posts, but all those annoying RTs will be gone forever (unless she uses the old school RT method, that is). Context and Discovery: Whenever you see a retweet, Twitter will present you with the original, unedited tweet next to the name and photograph of its author. This means you may see a lot of unfamiliar faces popping up in your Twitter stream from now on. The advantage of seeing all those new users is that you're immediately exposed to new users, and you may even choose to start following some of them. Retweet Sidebar: If you're worried about missing the latest RTs, just click on the "Retweets" filter in the right-hand sidebar on Twitter.com. This will bring up three different tabs to see recent retweets by other people, your retweets, and who is retweeting your messages. No Added Comments: You may be getting better context by seeing original tweets, but now you can't add your own comments when rebroadcasting these messages to the world. No more quips like, "this is hilarious!" or "LOL" or "so true, yet heartbreaking." But don't worry too much, because this may only be a temporary state of affairs. Williams said editing and commenting on retweets could be integrated into Twitter at a later date. If you feel you can't retweet without putting your own stamp on it, you can still use the original copy-and-paste method. someone you follow retweets an interesting message from PC World's Matt Peckham. If you wanted to start following him, you'd have to navigate to Matt's profile page and then choose to follow him from there. It would be so much easier if you could just choose to follow new users from your Twitter stream instead. Some third-party clients already do this, and it would be a great addition to Twitter.com. Twitter's newest feature may not be a welcome improvement for everyone, but if you value greater exposure to new voices over adding your commentary then you're going to love the new style of retweeting. Connect with Ian Paul (@ianpaul).